Back, Neck, Knee or Foot Pain? Easy Access from the Highway & Ample Free Parking! Dr. Brian Floyd Can Help! 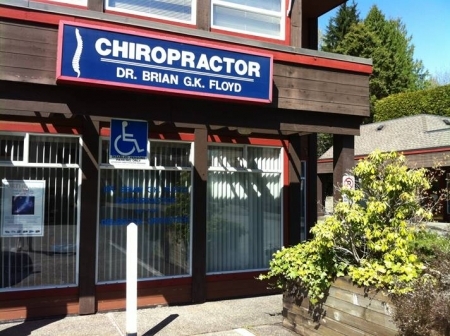 Located at Delbrook Mall in North Vancouver – easy access from the highway – Chiropractor Dr. Floyd’s office has ample free parking and provides a friendly environment for treatment of a variety of neuromusculoskeletal complaints. We offer direct billing for most extended health providers! Low back and hip pain are two of the most common conditions treated by chiropractic therapy. If you’re suffering from neck, shoulder or arm pain, contact us to see whether chiropractic therapy is right for you. Are you suffering from chronic headaches or knee/foot pain? Contact us to see if we can help! Many sports injuries can be treated with chiropractic therapy. Contact us today! Brian has helped me so much with my back pain. His care has allowed me to continue with an active lifestyle. Brian is always available to me when I need work. Brian is also very knowledgeable about orthotics. I can't begin to tell you how much I count on Brian and appreciate all he has done for me. Thanks to Dr Floyd and his recommendation to add orthotics to my regular chiropractic, I have never felt better. Thanks! I credit Dr Floyd and his orthotics for helping me maintain an active lifestyle with much less pain. After having lower back surgery in 1991, It has been Dr. Floyd's Chiropractic care over the past 10 years that has enabled me to live virtually pain free, and, in recent years, able to compete in a triathlon, decathlon and 2 half marathons. Thank you Dr. Floyd!